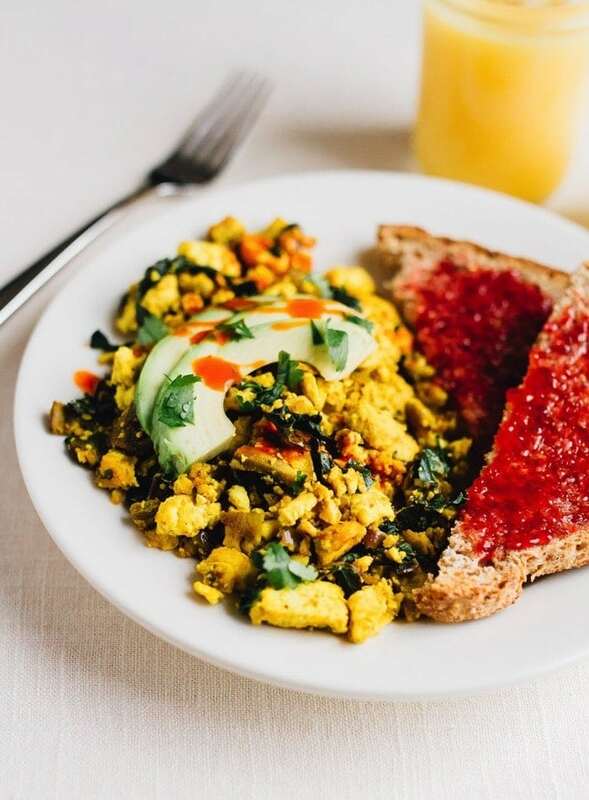 You’ll love the flavor of this protein-packed vegan tofu scramble seasoned with turmeric, cumin and nutritional yeast. 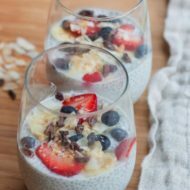 Serve with sliced avocado and toast for a delicious breakfast! I love a good scramble and my first experience with scrambled tofu was at a local café here in Richmond. The café has since closed, which is a shame, but I still remember that breakfast wrap. I loved the flavor of the tofu scramble and almost couldn’t tell that it wasn’t actual scrambled eggs. I’m honestly not sure if I waited until the next day or if I simply rushed home and tried my hand at making a tofu scramble that afternoon, but I remember being shocked by how easy it was. Once you have the tofu crumbled into bite-size pieces, there’s nothing more to do than season it while sautéing until it’s golden in color and warm. That’s the beauty of tofu — it’s already cooked and it takes on the flavor of whatever you season it with. For this scramble we’re using turmeric, which has anti-inflammatory properties and gives the tofu a lovely yellow color. There’s also cumin, sea salt, ground pepper, which helps with the absorption of turmeric, and nutritional yeast. The nutritional yeast adds a nutty, cheesy flavor that makes this scramble absolutely delish so don’t skip it! For the veggies, I like tossing in minced garlic, onions, mushrooms and some sort of green like shredded kale or baby spinach. Of course, you can use whatever veggies you have on hand. 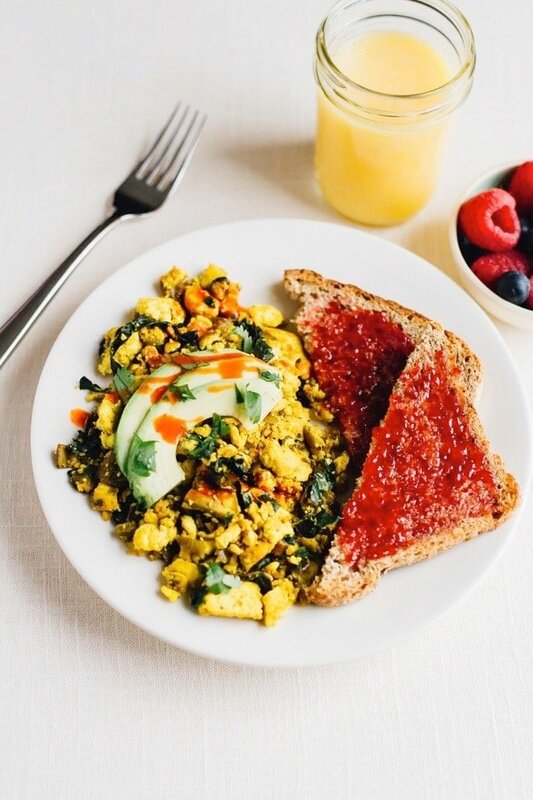 The texture of this tofu scramble is super similar to scrambled eggs and has a ton of protein, which makes it an excellent option for breakfast. That said, I like to eat scrambles for lunch and dinner too! This vegan tofu scramble is packed with flavor, has a great texture and easily lends itself to any additional veggies or spices you’d like to add in! Delicious served with sliced avocado and toast. Add oil to a large skillet over medium heat. Once hot, add garlic and onion and cook for about 3-4 minutes or until onions begin to soften. Add mushrooms to the pan and use your fingers to crumble the tofu into chunks before tossing it into the pan as well. Cook for about 10 minutes, stirring occasionally. If the tofu starts to stick or the pan becomes dry, you can add a little water to the pan. Add the turmeric, cumin, salt and pepper to the pan and stir to combine. Then add the kale and nutritional yeast. Stir and cook for an additional 3-4 minutes. Taste and season with additional black pepper and sea salt, if needed. Serve the scramble warm with sliced avocado and fresh herbs. I like cilantro. PS — Tofu scramble makes a great vegan substitute in recipes that use scrambled eggs, like this egg and hummus breakfast wrap. This recipe was originally posted in 2011, it has been updated with new photos and content as of January 2017. Looks great! I’ve always wanted to try scrambling tofu but it seemed scary. 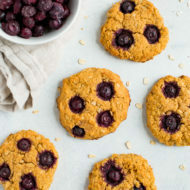 Thanks for the recipe girl! That combination of spices sounds superb. I can’t get enough of cumin. wow, it’s really amazing to hear what gets through TSA sometimes and what doesn’t! I definitely wouldn’t have thought that would have gotten through but glad for you that it did! 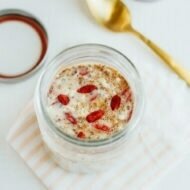 I LOVE overnight oats. Have a great trip! I love breakfast burritos, and this would be a perfect filling for one! 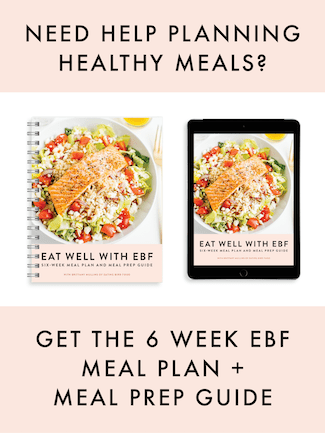 I’m never in the mood for eggs (or tofu) at breakfast, but I can see BFD in the future! Thanks for showing me how to do this! p.s. I just started following you on Twitter. Please follow me back if you’d like (@karmascorner). Looks fantastic. I can see with that combo of spices how it would be packed with flavor. LOVE scrambled tofu. It also works so well in the sloppy joe recipe as well. Been searching for an approved tofu scramble recipe. Thanks! Looks so good! 🙂 What a great way to start your morning! 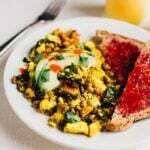 Back in my college days when I ate a nearly vegan diet, I practically lived on scrambled tofu! I still love it, even though I technicially include eggs in my eats these days. 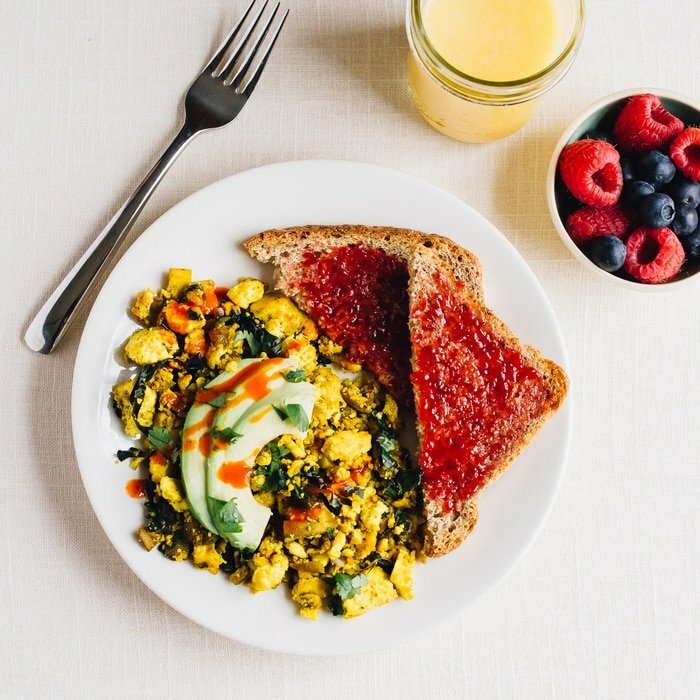 I love ordering tofu scrambles but really have never made it…that needs to change! this looks so tasty! I’ve been missing the warmth of scrambled eggs so perfect timing! Looks delicious. I absolutely adore tofu scrambles – for someone who doesn’t eat eggs, they are amazing! this dish looks amazing, I have been wanting to try a tofu scramble for awhile now! That sounds like the perfect weekend breakfast/experiment for me. I’m kind of scared to cook with tofu in my own home :-/ I know, I know. I eat it in restaurants, but there is just something about cooking it myself!! I guess I’m going to have to try it out, and a scramble seems like just the way to do it! I dont scramble ‘fu too often. However, with the looks of your recipe, that will be changing! This looks wonderful, great flavors and colors and such an easy main dish. Thanks! Looks delish, friend! Love turmeric so much. I put it on everything these days! Same! 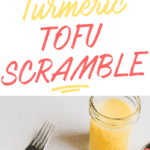 I love it in scrambles — tofu or regular eggs! I have always wanted to try this, and you make it look SO delicious!! What a fab dish — for any meal of the day! Love the color and the goodness that turmeric brings to the meal! waowh, looks delicious. I need to try this recipe. thanks for the article, is very useful. Just tried this and all I taste is the cumin! I would omit it altogether or at least balance the taste with some chili powder. Still a good recipe to play with. This recipe was horrible. Absolutely way to heavy on the cumin and I would recommend removing the mushrooms from the scramble after their cooked and then re-adding them at the end. My tofu scramble looked like dog food not “Golden”. I’m so sorry you didn’t like the scramble, Haley. Thank you for leaving your feedback!